If you’re looking to save money, you often look for a used appliance, but before you buy, make sure the appliance you’re buying still has the serial numbers on the unit. Kathy Pollok learned that lesson the hard way. She spotted a washing machine and dryer set for sale on craigslist. “It was pictured in a warehouse with very nice appliances around it so we thought we were buying it from a retailer,” she said. Once Kathy and her husband got to the Raleigh appliance warehouse to look at the set, she learned the retailer wasn’t selling it; instead, it was the warehouse manager selling it on his own from his work location. “When we found out we were buying from an individual we were concerned,” she said. But, the set looked brand new so she was less worried. “We could plug it in and it seemed to work fine,” Kathy added. The seller also gave her a written note that stated if the washer and dryer set didn’t work, Kathy had two weeks to return it for a full refund. Once Kathy got the set in her home the appliances worked, but she said that she didn’t use them immediately. “It took us a while to get plumbing work done at our house to mount back in this tight closet and run it full cycle,” she said. Once she did a full load, she said she realized that the dryer wouldn’t dry the clothes. Kathy called the manufacture and they sent out an authorized repair technician, who found the heat pump component defective, but he pointed out an even bigger problem. “He immediately said this is a new unit, and the tags have been stripped. He showed me the tag would have been right here, who knows that I would have never known that,” she said. Without serial numbers on the units, the manufacturer said there is no way to track a product without it. In fact, in North Carolina, it’s against the law to remove serial numbers from the property and sell a product without serial numbers. Here is the N.C. law. 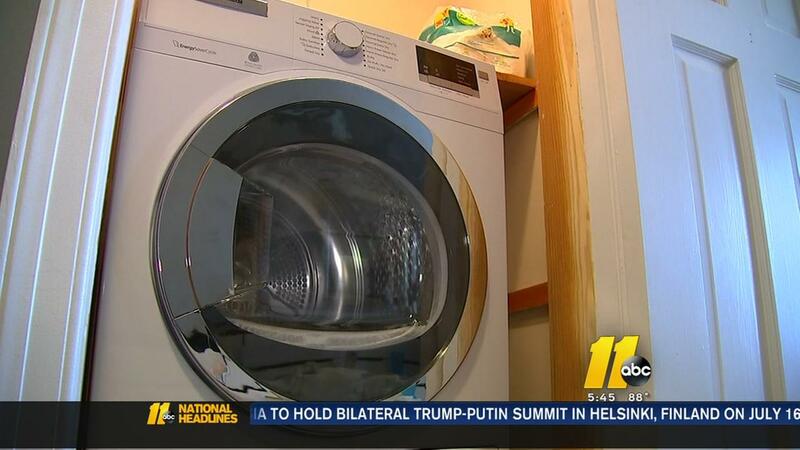 Appliance experts say an item without a serial number could mean it’s been recalled or deemed defective by the manufacturer. Kathy said she called the guy who sold the unit to her, and he did offer her a full refund of $800, but he wanted the appliances back. “If I give them back to him, he’s going to sell them to you, he’s going to sell them someone else,” she said. I reached out to the seller. While he admitted to selling out of the appliance center where he works, he said he was selling them for someone else, and he didn’t know the history of the appliance. He said that no one, including himself, ever checks serial numbers. Right after I contacted the seller, he immediately paid Kathy her $800 back that she paid for the unit. As for Kathy, that’s why she’s sharing her story; to make sure others know to make sure what you’re buying new or used it has the serial number on it. It’s typically a sticker or a metal plate on the appliance. Bottom line is that if you’re buying used or even open box appliances that appear new, before you hand over any money, check for the serial number. Again, it’s the N.C. law that this must be on the item if it has permanent identification marks like serial numbers. We reached out to the manufacturer to see if they could tell us the history of the washer and dryer set, but without the serial numbers, they tell us there is no way to track it. 1. NEVER purchase used appliances. If the dealer is authorized to sell their products. Do they have warranty information? Is the product current or discontinued? 4. Do not purchase Open Items online. 5. Look for an authorized appliance retailer, with product and warranty knowledge. 6. Know that open Items will require payment for delivery and installation. 7. Ask if the dealer provides service. If not, ask for the name of a local servicer. 8. Once the product is purchased, register the product with the manufacturer. 9. Note that Open Items usually do not have a warranty.